Who are the Carib people? Arawak people had conquered the Caribbean islands about 300 BC. Then about 1200 AD, Carib people started trying to conquer the Arawak. In the middle of this process, with some islands Carib and others still Arawak, the first European invaders showed up to conquer them all. Why did Columbus come to the Caribbean? When Christopher Columbus sailed to the Caribbean from Spain in 1492, he was looking for gold, pearls, and a good place to grow cotton and sugar. And he found most of that (just not much gold). So he was pretty happy with his conquest. So were the rulers of Spain, Ferdinand and Isabella. What happened to the Native people? 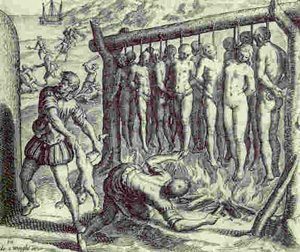 But Columbus’ conquest was nothing but bad news for the Arawak and the Caribs. Columbus and his sailors carried over germs from Europe. Most of the Arawak quickly died of smallpox, measles, malaria, dysentery, and other European diseases. After most of the Arawak and Caribs in the Caribbean were dead (more survived in Venezuela and Surinam), Spanish and British traders brought over boatloads of enslaved African people. Now the Africans had to work for them in the Caribbean growing sugar and diving for pearls. The Africans brought up so many thousands of pearls that the pearl oysters almost died out, and after that they mostly focused on sugar. Thousands of Africans died, too, because the Spanish and the British and the French beat them and starved them and made them work too hard. And the Africans brought yellow fever and malaria with them, which killed even more Arawak and Carib people. Spain lost control of Cuba and Puerto Rico in 1902. Cuba became independent, but Puerto Rico became a possession of the United States, which it still is today. 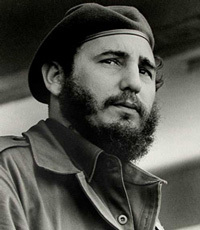 In the 1950s, Fidel Castro overthrew Cuba’s dictator and set up a Communist government there. He cancelled debts and redistributed land. Cuba helped Angola win independence too. Castro got support from the Soviet Union, and the United States still today does not allow most countries to buy anything from Cuba. Some other Caribbean islands also became independent, but Britain, France, and the Netherlands still rule other islands. On most of the Caribbean islands, African-descended and Native-descended people still produce sugar there while most of the profit goes to Europeans or Americans. Others work as waiters or cleaners serving white American and European vacationers. Many Caribbean people still live in slavery, or close to slavery. Cite this page: Carr, K.E. Caribbean history – South America. Quatr.us Study Guides, September 8, 2017. Web. April 23, 2019.